The Brydge is a high-quality aluminum keyboard and stereo speaker unit into which you slide your full-size iPad (2,3,4) and then link via Bluetooth. The combination is like turning your iPad into a small MacBook Air. For those who need this kind of duo, it's a first-class way to go. This is a product review, but I need to back-up for just a minute to explain some history. Back in April, at Apple's earnings report, Tim Cook responded to a question about convergence. Would the iPad and the MacBook ever merge to create what what later coined as a toaster-fridge? I wrote an editorial about all that: "No FridgeToaster for You: Let the iPad Evolve." It explains why Apple isn't going down that road for its millions of customers. So first and foremost, this review is not about whether a toaster-fridge is a good idea or not. It's an irrelevant question in this context. How secure is the iPad in the hinges? Next, I don't believe this product is about selecting just a MacBook or just an iPad based on price. A top end 64 GB Wi-Fi iPad4 ($699) plus an aluminum Brydge+ ($210) costs about the same as a 11.6–inch 64 GB MacBook Air ($999). But making that choice based on variations in price ignores the specific needs one might have in usage, OS and apps, and I believe the decision is based how one may need to augment an existing iPad, not chose one or the other. So with that out of the way, on to the review. 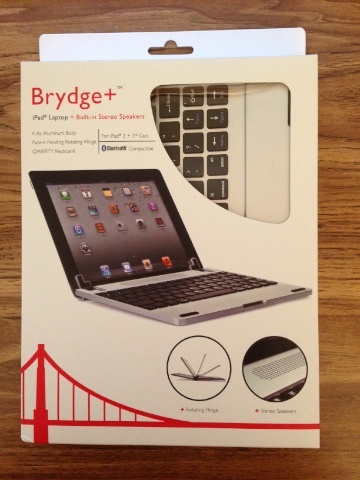 The Brydge solves several problems common to some iPad users. It protects the display when closed. It provides stereo speakers instead of the iPad's mono speaker. It provides a first-class keyboard for content creation, and it matches the style of similar Apple products. 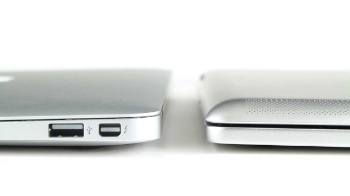 As a result, a casual observer might mistake the Brydge plus iPad as an 11-inch MacBook Air. And so what one has is a unit that preserves the quality, looks and craftsmanship of the Apple product line, and that's a plus. The Brydge is a product one can take pride in. Note: there are two models: aluminum "Brydge+" and polycarbonate "Brydge." There's more on that below. For editorial simplicity, I'll just refer to this product, generally, as the Brydge. 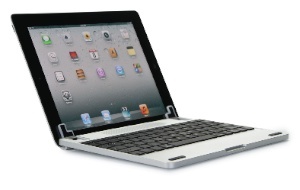 The Brydge is designed to be used with the iPad 2,3 or 4. One must remove any cases and insert the iPad into the hinge units. There is a plastic shim on the inside of the hinge that has the perfect amount of friction. That is, the iPad is both easy to remove, but it's also securely held. While Brydge doesn't recommend it, one can can hang the unit upside down without fear that the iPad will fall out. I've tried it. The default shim set is for an iPad 2. Extra shims are included for the iPad 3 or 4, and they're very easy to replace once . I changed from iPad 2 to iPad 3 shims without a problem. It's a handsome device indeed. Alert readers will note that the design for attaching the iPad has changed since the original concept. The developer explained, "The original design was modified for two reasons. First, the new design is future proof allowing the hinges to fit the iPad 2, 3rd and 4th generations, and in all likelihood future versions of the iPad. This means customers won't need to buy a new keyboard when they upgrade their iPad. Secondly, the new hinges give more of a minimal look, showing off the beauty of the iPad design. We have received extremely high praise via email from everyone who has seen the new design and are thrilled with the response we've received." Once attached, you pair the keyboard and the speakers separately to the iPad via Bluetooth. Like most Bluetooth keyboards of this design, it has a small battery unit and a micro USB to USB cable is included to charge it. The Brydge FAQ says that the lithium ion battery should operate for several months (without speaker use.) The first-rate on/off switch doubles as an indicator. It glows red while the cable is connected and charging. When the cable is disconnected, it blinks blue periodically to show that the battery has a good charge, and then turns red when it needs charged. I liked the design. The developer notes that when the unit is turned on, the speakers are not automatically paired in order to conserve battery power, and I think that's a sensible approach. It only takes a few seconds to pair the speakers to the iPad when you need them. 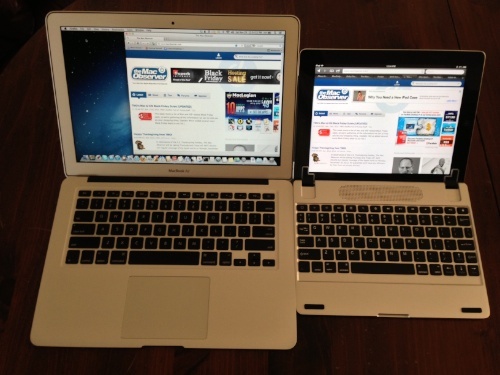 Side by side with (2011) 13-inch MacBook Air on left. The illusion that I had a MacBook Air in my lap was so convincing, at first, that I found my thumb instinctively reaching for the the trackpad -- one that doesn't exit. I had to remind myself: "This an iPad, dummy. Reach out and touch the screen!" Followers of the convergence issues discussed in the preamble above will be happy to know that when the combo is resting comfortably on your lap, there really is no "gorilla arm" issue. That is, I didn't find that my arm got tired on those few occasions when I had to touch the iPad's display. That's probably because I was immersed in writing these notes. (By the way, my preferred tool for that is UX Write.) While this mode of operation, typing then touching the screen occasionally, is a bit alien, I got used to it quickly. The keyboard is laid out exactly like a MacBook -- except for the top row of function keys. The function keys provide handy operations like going to the Home page, music player control, brightness control, search, slide show and a Lock key. The feel of the keys is good and have just a tad more resistance than my MacBook Air. And they make a soft click. I can't say one is better than the other, but I tend to favor the softer, quieter keyboard on my MBA. However, I can also see how a smaller sized keyboard may benefit from more audio feedback. Because the keyboard is only 9 inches wide and the center to center spacing is just a bit less than a MacBook keyboard, the initial user experience isn't quite the same. I had to adapt a bit, but then I was typing pretty much full speed after awhile. I was initially tempted to describe it as not a pure writer's keyboard, but seeing how some people work always amazes me. So I won't make that assertion. There is no LED light for the caps lock mode. Also in the latest models, based on feedback, the Cut, Copy and Paste keys have been replaced by Brightness keys. As I described above, the hinge mechanism has changed from the original concept shown in the Kickstarter videos. The current design allows the iPad to rotate through a full 0 degrees (closed) to 180 degrees, laying open and flat. The only port that's covered by the hinges, which by the way do not block the display, is the SIM port -- if the Home button is placed on the right side. When the Brydge and iPad close together or open up, the iPad sleeps and wakes. However, I did find what I believe is a correctable problem with the keyboard layout. In a fashion somewhat like some of the early Apple IIs, the Lock button is too close to the Backspace button. If you make a lot of typing errors on that smaller keyboard, you're going to hit that Lock button often and exit your app. The good news is that after you swipe past the Lock Screen, you're back where you were. Still, it's aggravating. I recommend one small change: the Lock key's icon be colored blue and accessed only with the Function prefix key. Another issue I noticed is related to the speakers. If you play a song via the Apple's Music app, all's well. But if the speakers have powered down to conserve battery, and you, for example, send an email, instead of hearing the expected "swoosh" sound, the first time, you'll hear a click. That's the speakers waking up again. It's a minor issue, but something to note lest you think there may be a problem. 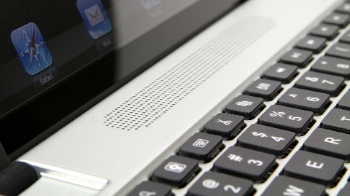 With a MacBook, the guts of the machine are below the keyboard, and the LCD display is fairly light. 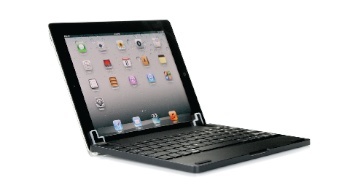 However, with the Brydge, you have the entire weight on the iPad and all its innards hanging behind the keyboard. That produces a different kind of feel. It's not particularly bad, but one does have to be a little more careful handling the combo unit to take that shifted center of gravity into account. For example, if resting far out on your knees and you release your wrists, it could topple backwards, overboard. The Aluminum Brydge weighs 1.3 lbs, so the total system weight with a Wi-Fi iPad 4 is 2.74 lbs. The two together are about 19 mm thick. The thickest part of my MBA is about 17 mm. 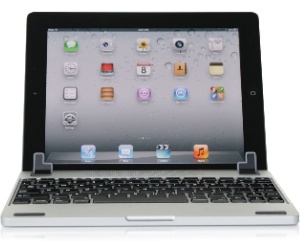 Prior to this review, I was using an iLuv Flexi Gel case for my iPad 3. This case has to be be removed, exposing the aluminum back of the iPad. I don't like that. However, it might be possible to cut out parts of that case so that the case will still protect most of the back of the iPad and still allow the iPad to slide into the shims. That would also add a little bit of weight to the iPad and affect the balance of the system even more. Plus it would look awful when the iPad is removed from the Brydge. Perhaps there is an opportunity here for a custom designed gel case. A small four page Quick Start guide accompanies the Brydge in the box. There is a full manual available online. Despite the capabilities and the cost associated with a device like this, it really is easy to use and the manual reflects that. The packaging, shown above, is sturdy and descriptive. Since the initial announcement, Brydge has developed two models. There is a black polycarbonate model which sells for US$150 and is called the Brydge. The original aluminum model, the Brydge+, sells for $210. The developer says that the aluminum is the same kind that Apple uses. Also, note that neither Brydge works with the iPad 1. The company is now accepting pre-orders from the public, and the official launch is December 1st. All pre-orders are guaranteed to arrive before Christmas. This product is drop-dead gorgeous. (I reviewed the aluminum model.) If you have a need to protect your iPad's display on travel, write notes and travel reports, or even if you're soon on a plane to Saint Croix to write a novel on the beach, you will want a Brydge. The materials, the fit and finish, the power switch/LED, the design and the keyboard are all first-rate. The whole system is a joy to hold and use. The unit is thoughtfully designed so that it can grow with you. The new hinge design is designed to accomodate, as best as possible, future 9.7-inch iPads -- so it won't become obsolete quickly. I think the pricing is spot on, and reflects the above mentioned design, quality and materials. In my own case, as a writer, I can appreciate how one can be writing a major document and then, in a few seconds, undock, and be able to treat the iPad as a pure tablet for other purposes. In fact, several pages of notes for this review were composed on the iPad/Brydge+ with UX Write and then edited for publication on my iMac. As I mentioned above, not everyone needs to work this way, but for those who do and want some serious quality, the Brydge is a godsend and a delight. I predict that many of you will want one, without a doubt, for Christmas. Well designed, great fit and finish, MacBook-like design of keyboard and features, stereo speakers, looks terrific, easy and secure docking, easy iPad removal, replaceable hinge shims, Bluetooth connection for keyboard and stereo speakers, aluminum or polycarbonate models, charger cable included, easy to use and clear documentation. Designed, insofar as feasible, to accomodate future 9.7-inch iPads. Duo is a bit top heavy, inconveniently placed Lock key. Hard to protect back of iPad with conventional cases.